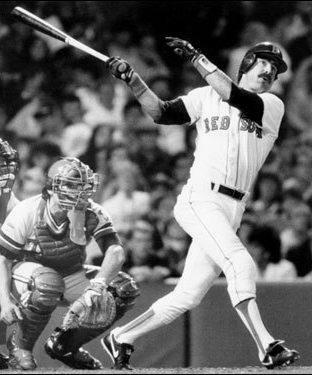 Former All Star and batting champion Bill Buckner had more career hits than Hall of Fame heroes Ted Williams, Mickey Mantle and Joe DiMaggio. 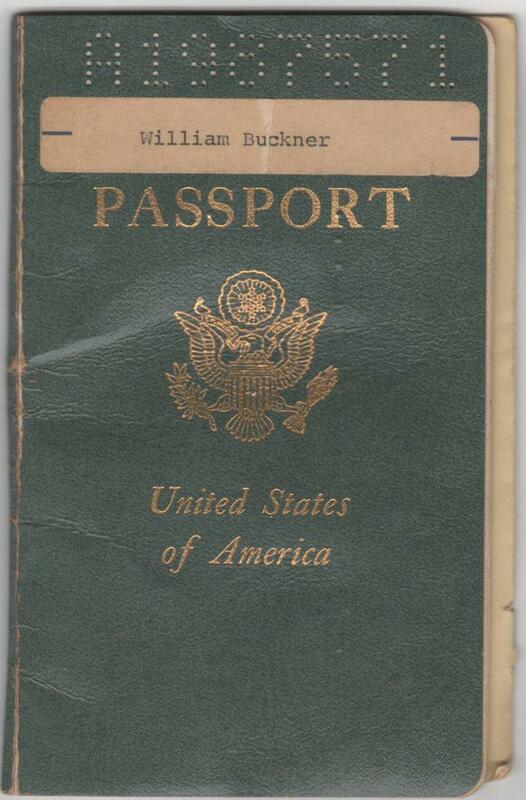 In the collection is this passport issued by the United States to baseball star Bill Buckner during his teen years. 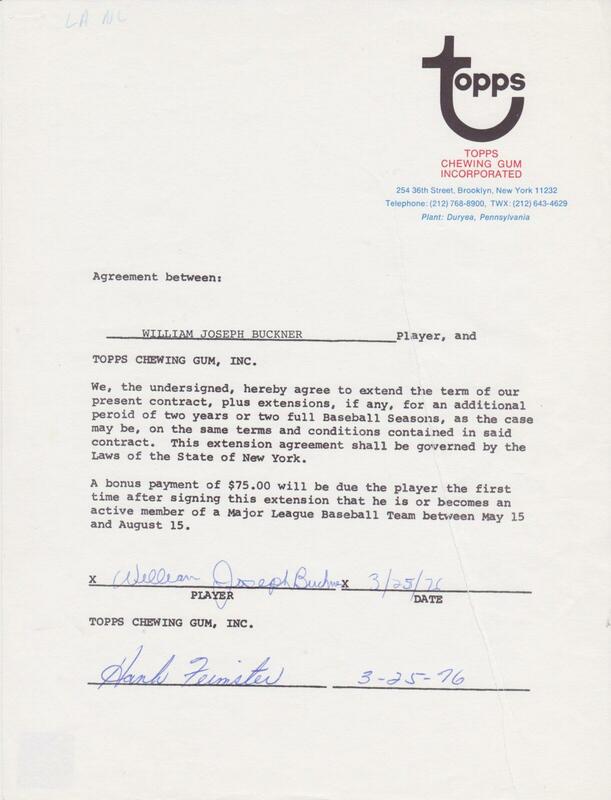 Dated just 18 days after Buckner played his final game of 1970, this official document was issued on October 19, 1970. Though his status as a rookie was still intact, Buckner was a veteran of 29 big league games when the passport became legal two months before his 20th birthday. The former batting champion has signed the inside of the passport multiple times. Buckner enjoyed an outstanding career while playing for the Dodgers, Cubs, Red Sox, Angels, Royals during his 22-year MLB career. 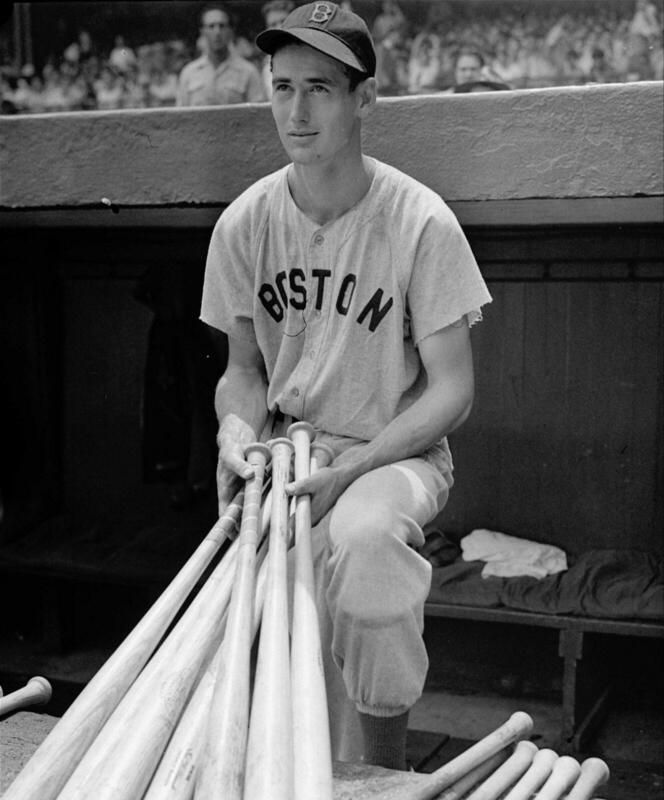 Along the way he was an All Star, a batting champ, and the owner of 2,715 career hits — more than Joe DiMaggio, Ted Williams, or Mickey Mantle. Personal items such as official passports rarely reach the memorabilia market. 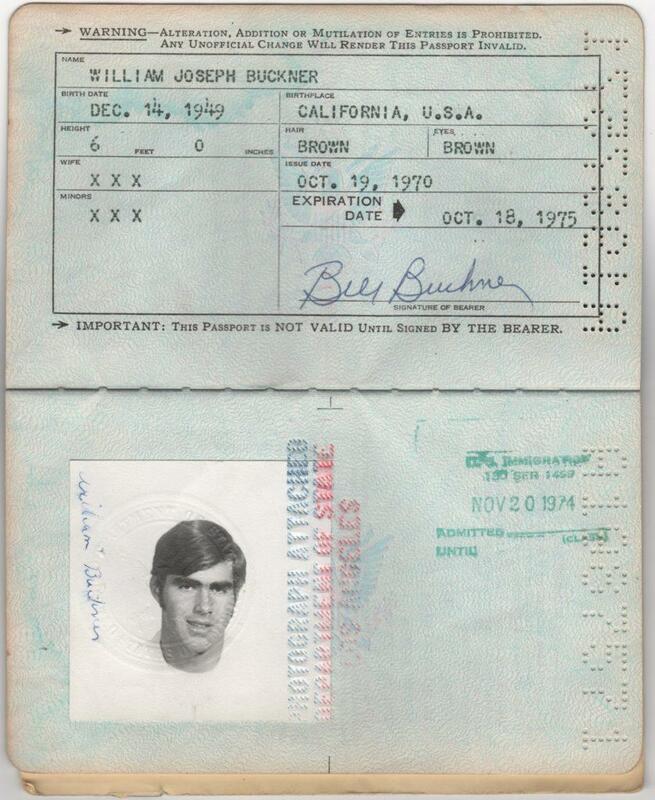 A picture of 19-year old Bill Buckner adorns the inside page of the player’s USA passport issued in 1970. 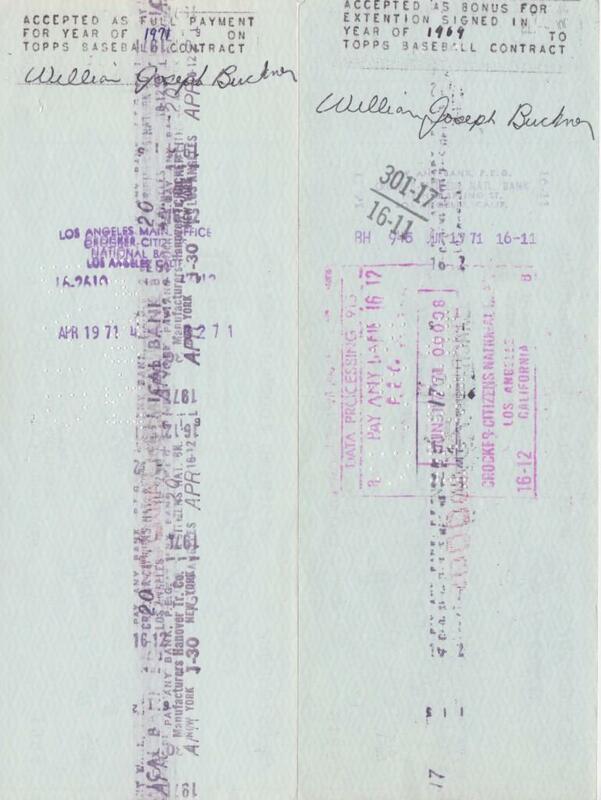 Buckner has signed his more familiar autograph with his first name though inside of the document is an international certificate of vaccination with a more formal and legal, “William J. Buckner”. Buckner wasted no time in putting the passport to use as evidenced by the October 21st stamp from the Dominican Republic just two days after the passport was issued. His exit from the Dominican appears to be a month later on November 21, 1970. From there he visited Venezuela where he left on December 29 of the same year. One must wonder if the visits were baseball related. The passport has no more stamps until 1974 when Buckner visited Japan inNovember of 1974 for two weeks. The document with a October 18, 1975 expiration date provides an interesting insight early in the career of one of baseball’s most memorable players. Here’s the start to what would be an outstanding career. Buckner signed this contract June 21st, 1968, six months shy of his 19th birthday. 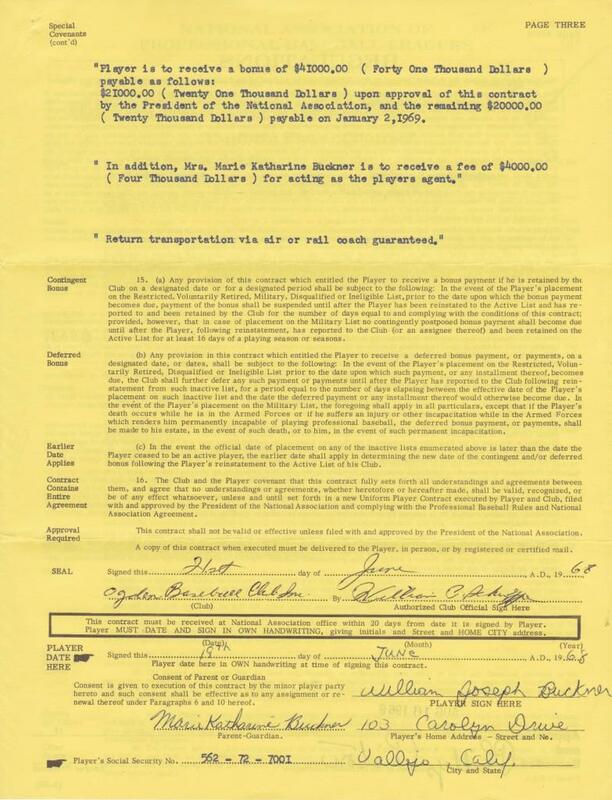 The contract calls for Buckner to make a measly $500 per month while playing for the Rookie League Ogden Baseball Club in the Pioneer League. The signature page bears not only the autographs of Bill Buckner, but also that of his mother, Mary Katherine. 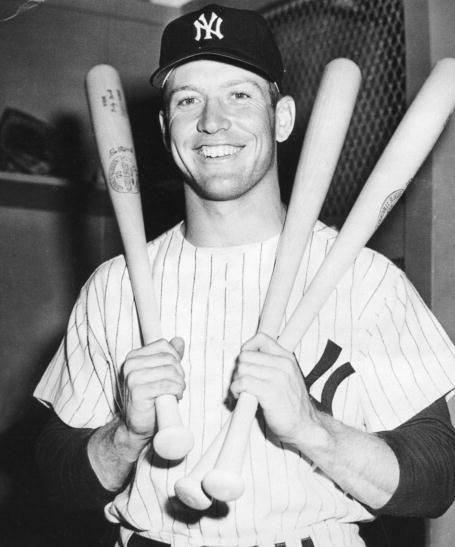 He would play only three seasons in the minor leagues before embarking on a 22-year odyssey in the Major Leagues. 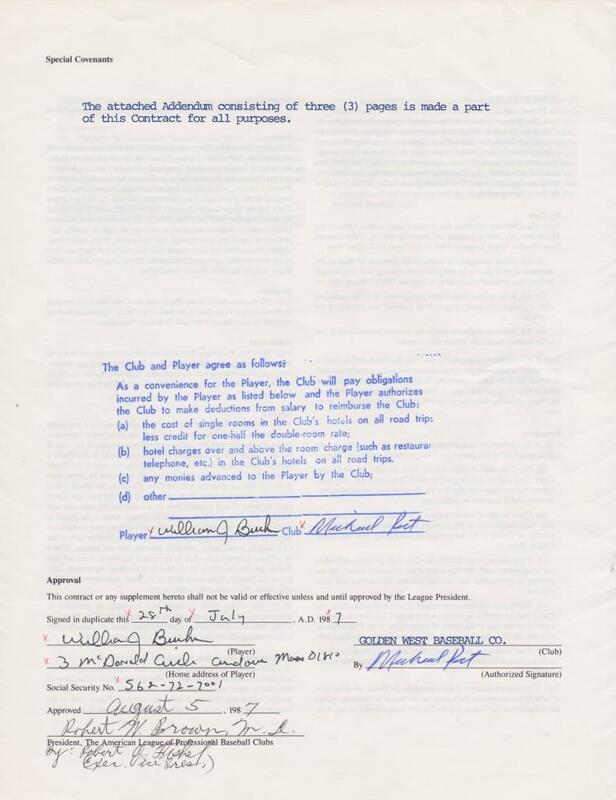 He lasted all of 64 games with the Ogden club for which this contract is signed. 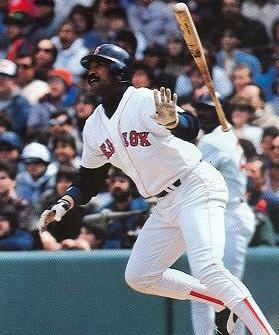 In 281 career minor league games, Buckner hit .352. Topps approached Bill Buckner with a contract to appear on baseball cards. Imagine the thoughts running threw his head, just six months after his 18th birthday. 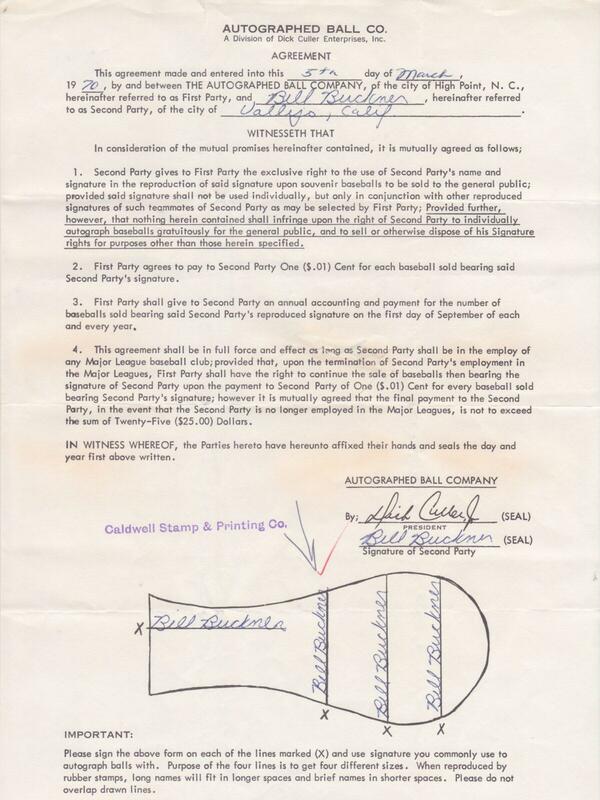 In the collection is the contract Buckner signed to first appear on the cardboard keepsakes. 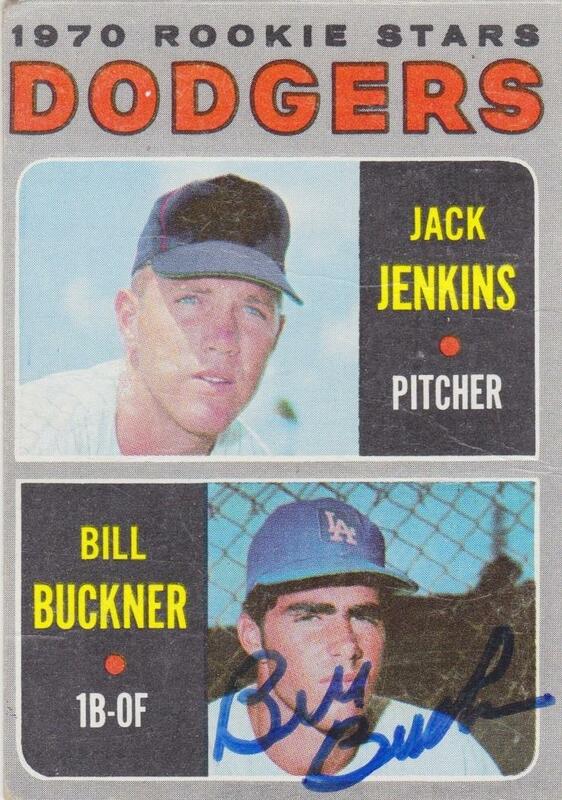 Buckner’s signature appears next to Topps executive Sy Berger where both have dated it 6/28/1968. Berger is credited with designing the 1952 Topps set and was honored by the Baseball Hall of Fame in 1988. On the back side of the contract is the parents consent signature line. Because of Buckner’s age, he would need one of his parents to grant permission to sign the contract. It appears Buckner has written his mother’s name on the signature line. On the back side of the contract is the parents consent signature line. Because of Buckner’s age, he would need one of his parents to grant permission to sign the contract. It appears Buckner has written his mother’s name on the signature line. It’s easy to picture an 18-year old coming up with this “solution”. His printing has been crossed out and his mother has signed the consent above it. Shown here is the first contract extension that Buckner signed with the Topps Chewing Gum company. One can imagine how excited the 19-year old Buckner was in 1969. 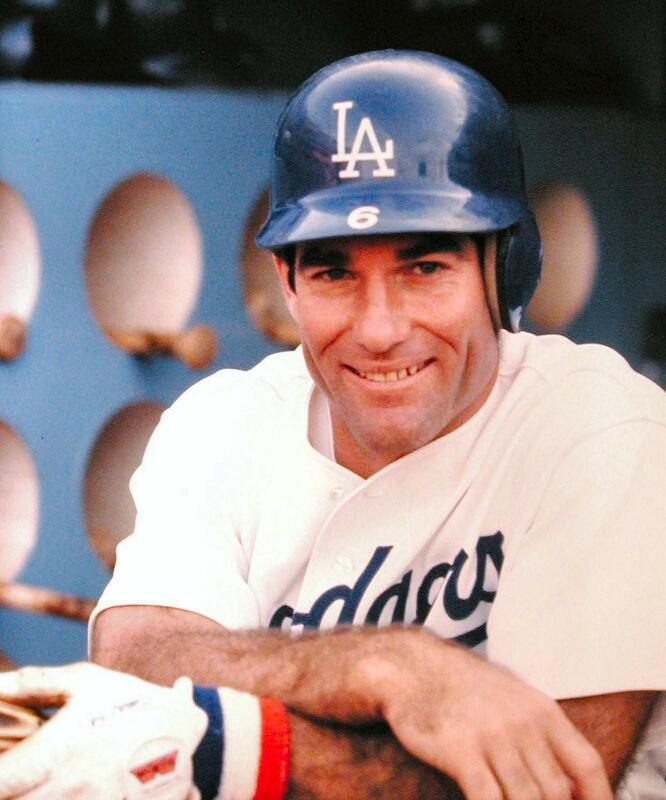 He played Major League Baseball until age 40. 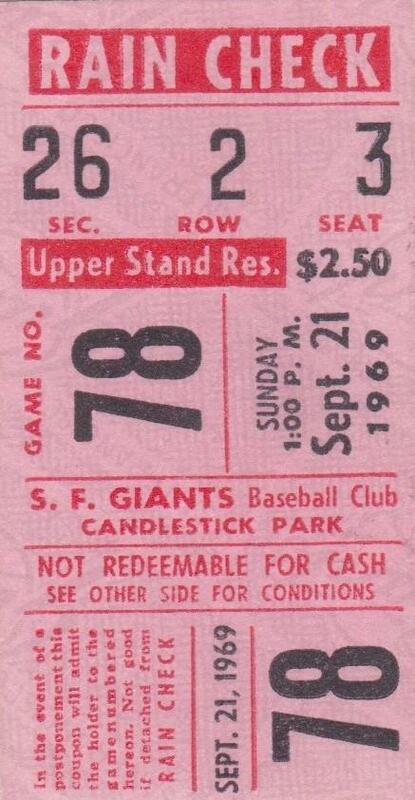 This ticket gained one lucky fan admission to Bill Buckner’s MLB debut on September 21, 1969. Buckner went 0-for-1 as a pinch hitter in a game that was started by two Hall of Fame pitchers, the Giants’ Gaylord Perry and the Dodgers’ Jim Bunning. 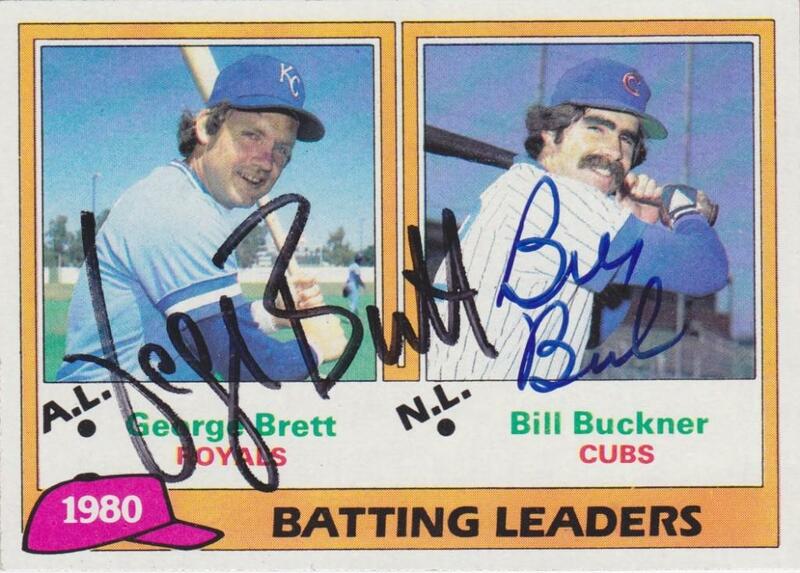 Another early example of Bill Buckner’s autograph. This one is on a contract to appear on souvenir baseballs with stamped signatures of the entire team. Buckner received a whopping one penny per ball sold. Before the free-agency era, every additional source of income helped players make a living. The first Bill Buckner baseball card from the 1970 Topps set. Here Buckner signs along his image that is lacking his now trademark mustache. Jack Jenkins, the pitcher shown here with Buckner went winless in 8 career games though he did record one Major League hit. Big money for Bill Buckner. 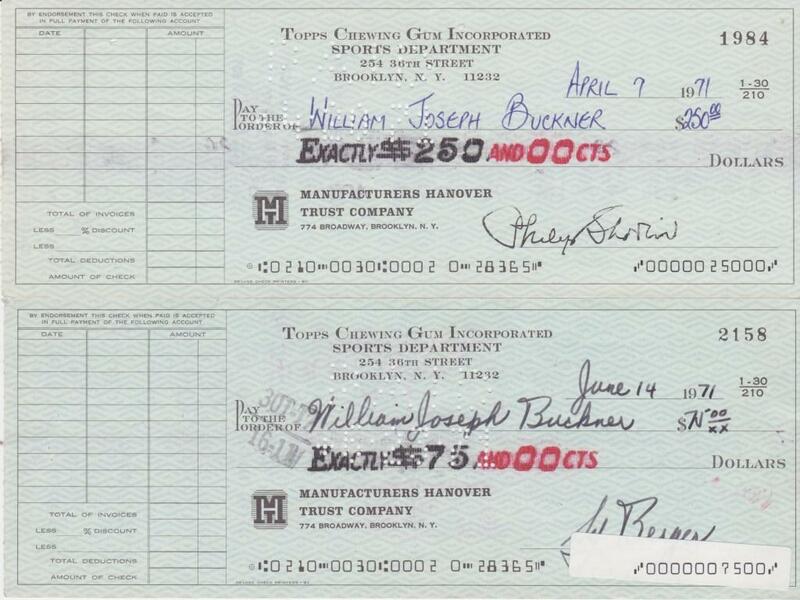 In just over two months, Topps paid Buckner $325. 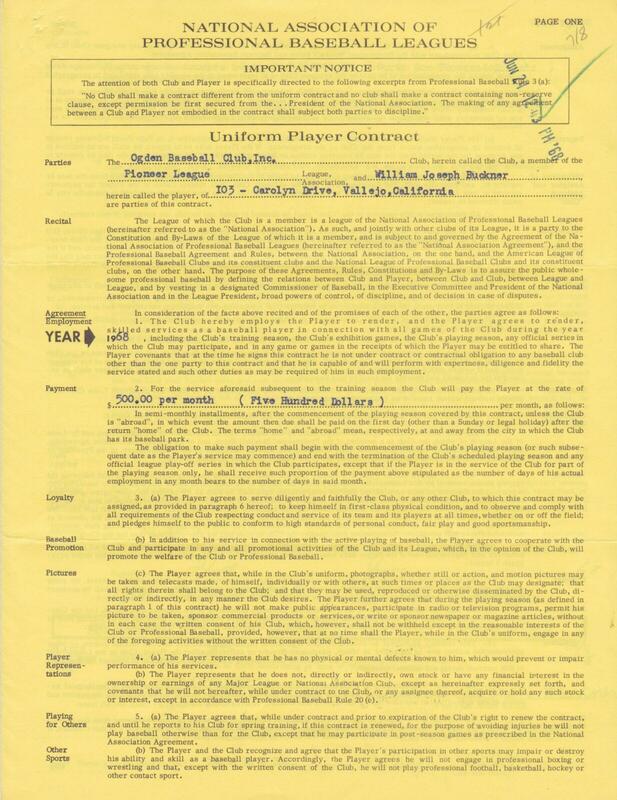 It might not sound like much, but keep in mind the Major League minimum in 1971 was $12,750. With today’s MLB salaries, it’s easy to see how different the economics are compared to yesteryear. Early Buckner signatures can be found on the back of each of the two checks. Buckner has signed his full legal name, “William Joseph Buckner”. Checks endorsed by players provide collectors with reliable examples of their autographs. 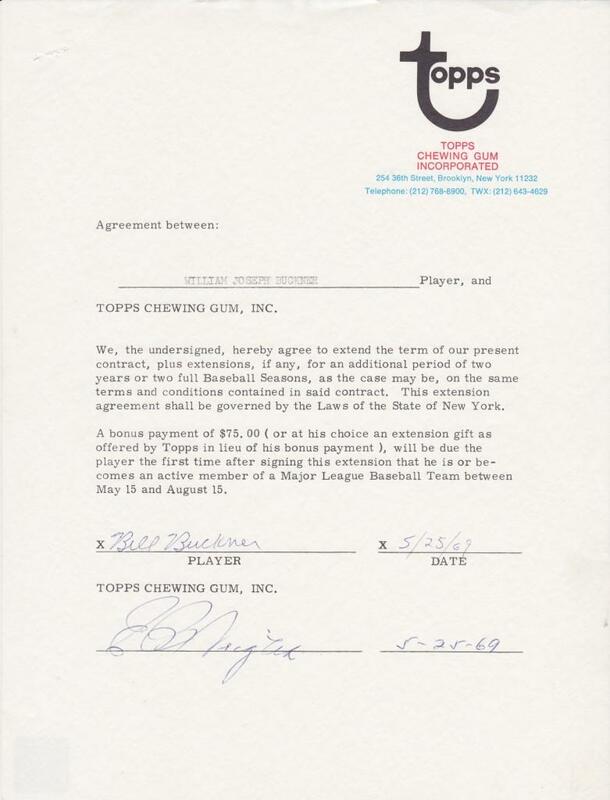 The year following the two Topps checks above, Buckner signed another contract extension. This one calls for $75 and is signed on March 3, 1972. Here Buckner signs a more familiar, “Bill Buckner”.The 1972 season would see Buckner produce a .319 average and strike out only 19 times in 405 plate appearances. The Major League Baseball Players Association sent out questionnaires like this one to its players to determine what endorsements each man had. Today’s players compliment their baseball salary with off field endorsement but that wasn’t always the case. 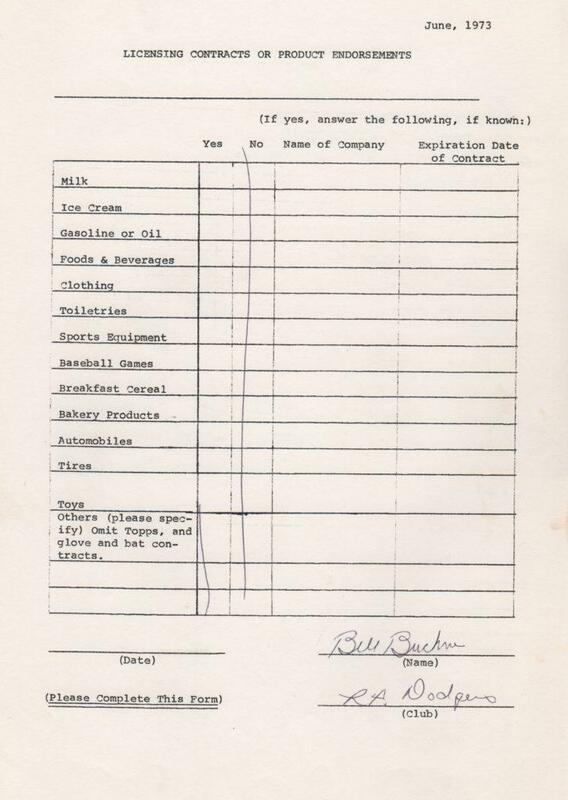 This document filled out by Bill Buckner in 1973 shows him to have no endorsements whatsoever. 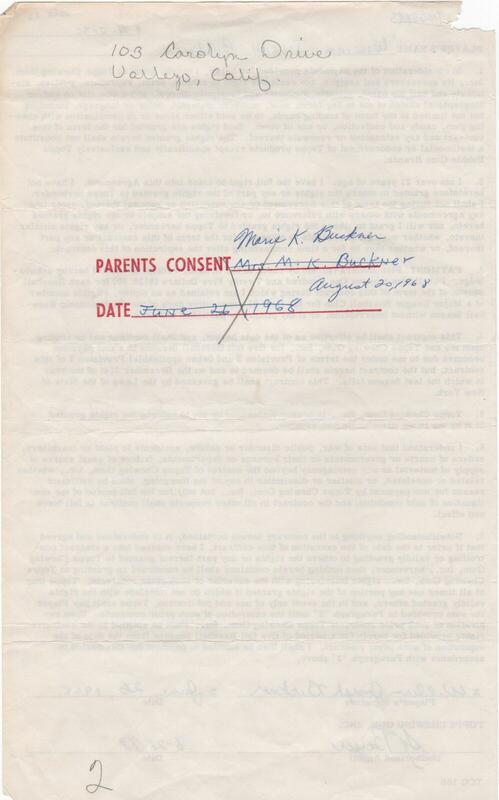 Shown here is the closeup of Bill Buckner’s signature at the bottom of the 1973 MLBPA endorsement questionnaire. Just below his signature, Buckner has written, “LA Dodgers”, the club with which he spent his first eight Major League seasons. Buckner hit .289 for the Dodgers, the exact same average for his 22-year career. This artwork appeared on the back of Buckner’s 1975 Topps card. 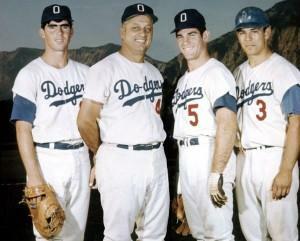 The question revolves around the Dodger franchise that Buckner played for that year. Do you know the year of Brooklyn’s only championship. Would you have gotten the trivia question right? Yet another Topps extension, this one for 1976. Buckner goes back to his more formal, “William Joseph Buckner” on 3/25/1976. The ’76 campaign would be Buckner’s last with the Dodgers before being traded to the Chicago Cubs for Rick Monday. Buckner was among the games best hitters and toughest to strike out. In 1980 he won the National League batting crown. This Topps card show him with George Brett, the American League batting champ and is signed by both. 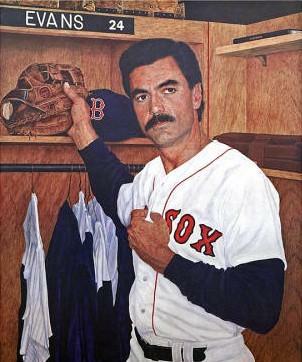 Though he played in Los Angeles and Chicago for eight years each and in Boston for only five, Bill Buckner is best remembered as a member of the Red Sox. In the collection is a payroll check from the Sox dated May 7, 1985. That season, Buckner played in all 162 games for the only time in his career and posted a career high 110 RBI. 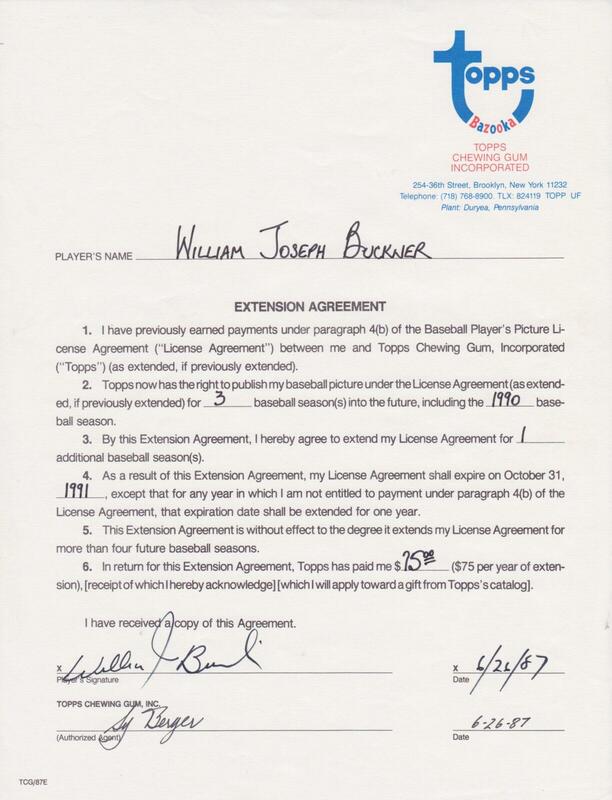 On this Topps contract extension, Buckner offers a variation of his signature, penning, “William J Buckner”. This is dated July 26, 1987, two days before the Red Sox traded him to the Angels. 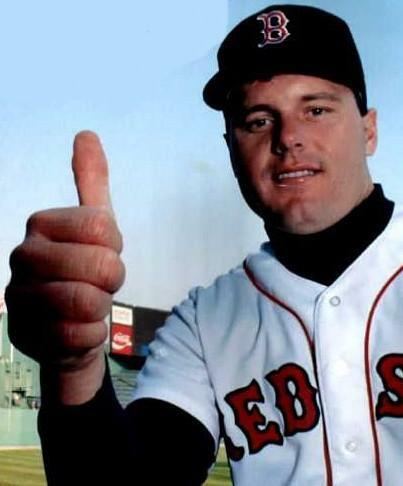 After committing the error in the 1986 World Series, the Boston fans were relentless in their poor treatment of their former beloved first baseman. It is so bad that the Red Sox decided to release him. With 72 hours Buckner had offers from five other big league teams before choosing to sign with the Angels for the rest of the ’87 season and the following year. Here is Buckner’s contract with Anaheim. 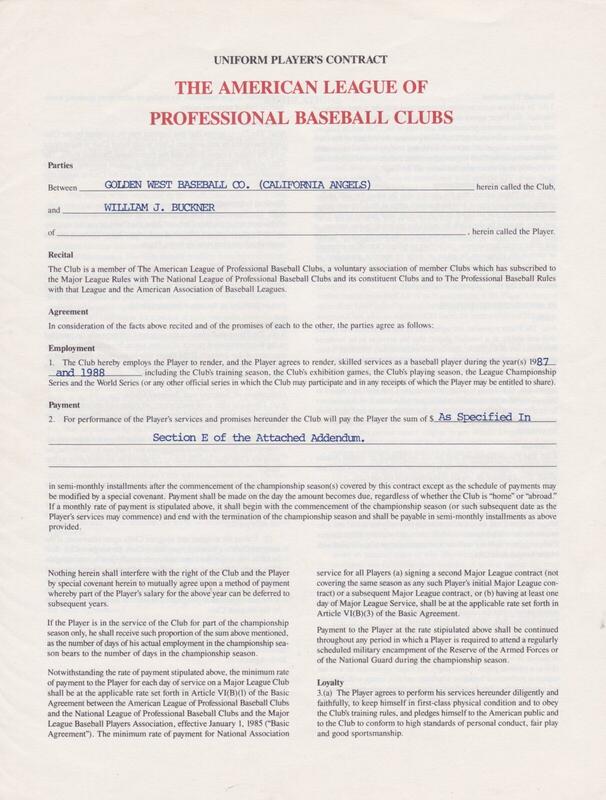 The signature page has the autograph of Buckner, Angels’ VP Mike Port, and the secretarial signature of AL President Bobby Brown as signed by Bob Fishel. Contracts often supply collectors with multiple signatures. 1990 ticket stub for Buckner's last homer - inside the park! Imagine the hobbled Bill Buckner hitting an inside-the-park home run. It’s tough to see. A quick youtube search shows Claudel Washington chasing Buckner’s drive down the right field line. Washington falls into the stands and is injured as Buckner makes his way around the bases. In another quirk to the hit, it came off of Kirk McCaskill. Though he hit a mere .235 (8-for-34) off of the righty in his career, Buckner’s last two homers including this one were off of him. Here is the ticket stub for Buckner’s last home run of his career. 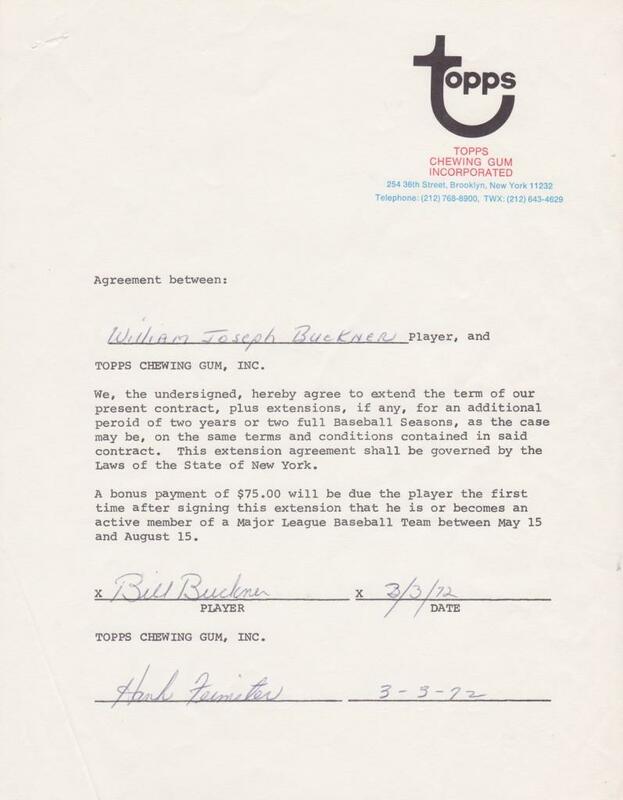 The collection starts with Bill Buckner’s first professional contract and ends with his final payroll check he received as a player. 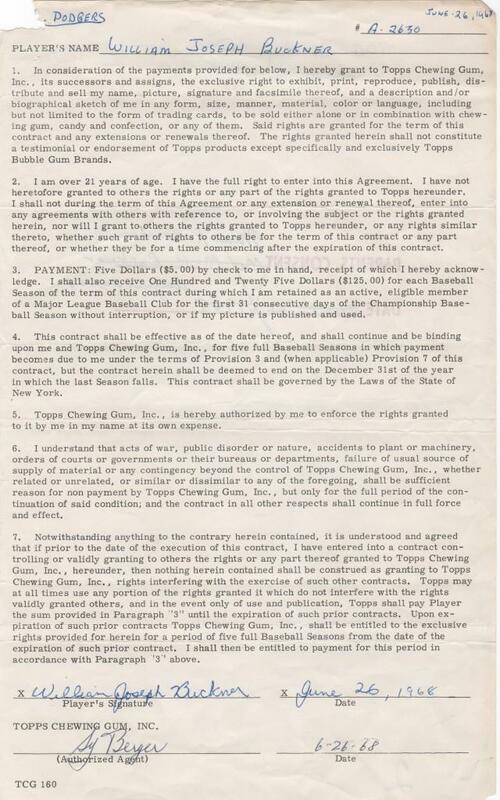 With quite a lot in between, the collection has one of the finest Buckner-related assemblies of contracts, documents, checks, and ticket stubs.